Don't be put off by the bland title, this is, in fact, a well-made, suspenseful thriller. 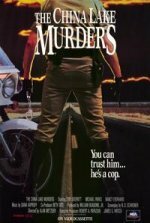 A city cop who goes on holiday every year to the small desert town of China Lake becomes the chief suspect in a serial murder inquiry run by the town's sheriff. It's essentially a taut battle of wills between the cop and the sheriff, and both the leads (Michael Parks and Tom Skerritt) bring much weight to their roles. The direction of TV-movie specialist Alan Metzger maintains the tension.